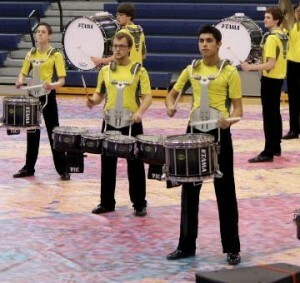 EAST MARLBOROUGH — Enjoy music, excitement and artistry as 36 indoor percussion ensembles from seven states compete at the Unionville Regional WGI “Sport of the Arts” show at Unionville High School, 750 Unionville Rd., (Rt. 82) on Saturday, March 22. The elite ensembles use an array of equipment, movement and skills to create thrilling shows. Percussive instruments and other props bring music and themes to life while showcasing technique, creativity and expression. The competition is divided into classes based on each program’s complexity and the group’s affiliation. Among the local units competing are Unionville, Coatesville Area, Downingtown West, Ridley and Upper Darby. Groups are travelling from as far as New England, New York and West Virginia to compete. Penn State and George Mason Universities along with the Cadets Winter Percussion and United Percussion will top off the competition with thrilling exhibition performances. Doors open Saturday, March 22 at 8:30 a.m., with the preliminary round starting at 9 a.m. Doors will reopen at 5:30 p.m. for the finals beginning at 6 p.m. Ticket prices are $10 for prelims, $15 for finals, $20 for a combination ticket. Cash and credit cards accepted. Food – including meatball sandwiches, Chicken Caesar salad, pizza, chicken sandwiches, tacos, snacks and baked goods – will be available all day. Since the event will be proceeding the entire day and evening, patrons are invited to drop by for a thrilling treat of live music and artistry in support of talented student musicians.